Percentage of adults aged 25 to 64 with an apprenticeship or trades certificate or diploma — N.L. Percentage of adults aged 25 to 64 with a college diploma — N.L. Percentage of adults aged 25 to 64 with a bachelor's degree or higher — N.L. Percentage of men aged 25 to 34 with an apprenticeship certificate — N.L. Percentage of women aged 25 to 34 with a bachelor's degree or higher — N.L. Percentage of adults aged 25 to 64 with an apprenticeship or trades certificate or diploma — P.E.I. Percentage of adults aged 25 to 64 with a college diploma — P.E.I. Percentage of adults aged 25 to 64 with a bachelor's degree or higher — P.E.I. Percentage of men aged 25 to 34 with an apprenticeship certificate — P.E.I. Percentage of women aged 25 to 34 with a bachelor's degree or higher — P.E.I. Percentage of adults aged 25 to 64 with an apprenticeship or trades certificate or diploma — N.S. Percentage of adults aged 25 to 64 with a college diploma — N.S. Percentage of adults aged 25 to 64 with a bachelor's degree or higher — N.S. Percentage of men aged 25 to 34 with an apprenticeship certificate — N.S. Percentage of women aged 25 to 34 with a bachelor's degree or higher — N.S. Percentage of adults aged 25 to 64 with an apprenticeship or trades certificate or diploma — N.B. Percentage of adults aged 25 to 64 with a college diploma — N.B. Percentage of adults aged 25 to 64 with a bachelor's degree or higher — N.B. Percentage of men aged 25 to 34 with an apprenticeship certificate — N.B. Percentage of women aged 25 to 34 with a bachelor's degree or higher — N.B. Percentage of adults aged 25 to 64 with an apprenticeship or trades certificate or diploma — Que. Percentage of adults aged 25 to 64 with a college diploma — Que. Percentage of adults aged 25 to 64 with a bachelor's degree or higher — Que. Percentage of men aged 25 to 34 with an apprenticeship certificate — Que. Percentage of women aged 25 to 34 with a bachelor's degree or higher — Que. Percentage of adults aged 25 to 64 with an apprenticeship or trades certificate or diploma — Ont. Percentage of adults aged 25 to 64 with a college diploma — Ont. Percentage of adults aged 25 to 64 with a bachelor's degree or higher — Ont. Percentage of men aged 25 to 34 with an apprenticeship certificate — Ont. Percentage of women aged 25 to 34 with a bachelor's degree or higher — Ont. Percentage of adults aged 25 to 64 with an apprenticeship or trades certificate or diploma — Man. Percentage of adults aged 25 to 64 with a college diploma — Man. Percentage of adults aged 25 to 64 with a bachelor's degree or higher — Man. Percentage of men aged 25 to 34 with an apprenticeship certificate — Man. Percentage of women aged 25 to 34 with a bachelor's degree or higher — Man. Percentage of adults aged 25 to 64 with an apprenticeship or trades certificate or diploma — Sask. Percentage of adults aged 25 to 64 with a college diploma — Sask. Percentage of adults aged 25 to 64 with a bachelor's degree or higher — Sask. Percentage of men aged 25 to 34 with an apprenticeship certificate — Sask. Percentage of women aged 25 to 34 with a bachelor's degree or higher — Sask. Percentage of adults aged 25 to 64 with an apprenticeship or trades certificate or diploma — Alta. Percentage of adults aged 25 to 64 with a college diploma — Alta. Percentage of adults aged 25 to 64 with a bachelor's degree or higher — Alta. Percentage of men aged 25 to 34 with an apprenticeship certificate — Alta. Percentage of women aged 25 to 34 with a bachelor's degree or higher — Alta. Percentage of adults aged 25 to 64 with an apprenticeship or trades certificate or diploma — B.C. Percentage of adults aged 25 to 64 with a college diploma — B.C. Percentage of adults aged 25 to 64 with a bachelor's degree or higher — B.C. Percentage of men aged 25 to 34 with an apprenticeship certificate — B.C. Percentage of women aged 25 to 34 with a bachelor's degree or higher — B.C. Percentage of adults aged 25 to 64 with an apprenticeship or trades certificate or diploma — Y.T. Percentage of adults aged 25 to 64 with a college diploma — Y.T. Percentage of adults aged 25 to 64 with a bachelor's degree or higher — Y.T. Percentage of men aged 25 to 34 with an apprenticeship certificate — Y.T. Percentage of women aged 25 to 34 with a bachelor's degree or higher — Y.T. 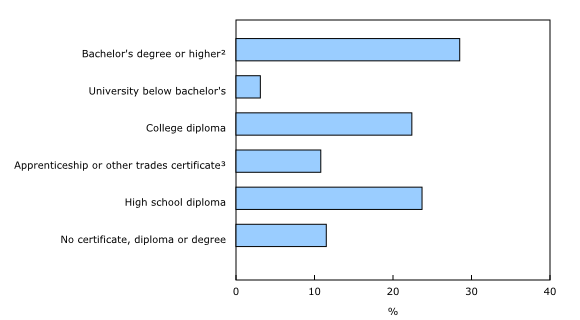 Percentage of adults aged 25 to 64 with an apprenticeship or trades certificate or diploma — N.W.T. Percentage of adults aged 25 to 64 with a college diploma — N.W.T. Percentage of adults aged 25 to 64 with a bachelor's degree or higher — N.W.T. Percentage of men aged 25 to 34 with an apprenticeship certificate — N.W.T. Percentage of women aged 25 to 34 with a bachelor's degree or higher — N.W.T. Percentage of adults aged 25 to 64 with an apprenticeship or trades certificate or diploma — Nvt. Percentage of adults aged 25 to 64 with a college diploma — Nvt. Percentage of adults aged 25 to 64 with a bachelor's degree or higher — Nvt. Percentage of men aged 25 to 34 with an apprenticeship certificate — Nvt. Percentage of women aged 25 to 34 with a bachelor's degree or higher — Nvt. In 2016, more than half (54.0%) of Canadians aged 25 to 64 had either college or university qualifications, up from 48.3% in 2006. Canada continues to rank first among the Organisation for Economic Co-operation and Development (OECD) countries in the proportion of college and university graduates. Today, Statistics Canada is releasing data from the 2016 Census on the education of Canadians. This release presents a portrait of the changing face of education in Canada and how Canadians are equipping themselves through education for the jobs of today. Canada has the highest proportion of college and university graduates in the OECD due to its large college sector, not seen in most other OECD countries. In 2016, 22.4% of the Canadian population aged 25 to 64 had a college diploma as the highest educational qualification, compared with an estimated 8% among OECD countries overall. In 2016, 40.7% of young women aged 25 to 34 had a bachelor's degree or higher, up from 32.8% in 2006. Young men have responded to job opportunities and earnings incentives by moving into the skilled trades sector. The proportion of young men with an apprenticeship certificate increased from 4.9% in 2006 to 7.8% in 2016. First Nations people, Métis and Inuit all made gains in postsecondary education at every level. In 2016, 10.9% of Aboriginal people overall aged 25 to 64 had a bachelor's degree or higher, up from 7.7% in 2006. The proportion of Aboriginal people with a college diploma rose from 18.7% in 2006 to 23.0% in 2016. In 2016, gains in education were also evident among mothers in lone-parent families and refugees. A higher proportion (20.4%) of lone mothers aged 25 to 64 in 2016 had a bachelor's degree or higher, up from 14.7% in 2006. Close to one-third (31.5%) of refugees who became permanent residents in Canada upgraded their educational credentials after arriving in the country. Over half of recent immigrants who landed in the five years prior to the 2016 Census had a bachelor's degree or higher. With an aging Canadian population and growing demand for knowledge and skills to meet the needs of the labour market, postsecondary education is critical to a prosperous future for Canada. Whether they have a degree in medicine or nursing, the majority of young graduates in health fields at all levels of education are women and they are finding work that matches their studies. 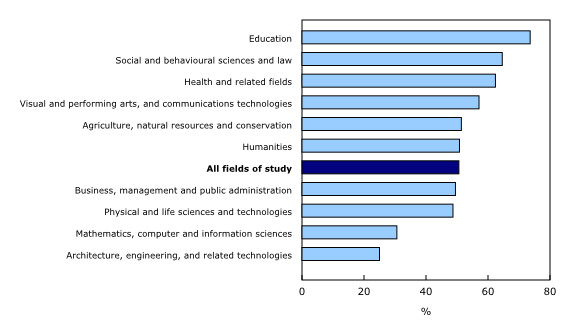 Young graduates in engineering or computer and information sciences are also very likely to work in occupations closely related to their studies. Among the provinces, the four largest ones (Ontario, British Columbia, Alberta and Quebec), along with Nova Scotia, had the highest proportions of the adult population aged 25 to 64 with a bachelor's degree or higher. The highest proportions of the population with a college diploma were found in the four Atlantic provinces (Newfoundland and Labrador, Prince Edward Island, New Brunswick and Nova Scotia). As labour market needs evolve, and the education system adapts to new demands for skills, the census provides an opportunity to see how Canadians are equipping themselves through education to meet these demands. The detailed demographic information in the census makes it possible to see the evolving educational choices of diverse groups in Canadian society. In 2016, more than half (54.0%) of Canadians aged 25 to 64 had either college or university qualifications, up from 48.3% in 2006. Canada continues to rank first in the proportion of college or university graduates among the OECD countries where, in 2016, the average was 36.7%. In 2016, 22.4% of Canadians aged 25 to 64 had a college diploma, 3.1% had a university certificate below bachelor's degree and 28.5% had a bachelor's degree or higher, adding up to 54.0% of Canadians aged 25 to 64 with either college or university qualifications. An additional 10.8% of Canadians had an apprenticeship or other trades certificate. In terms of high school education, 86.3% of Canadians aged 25 to 64 had completed a high school diploma or equivalency certificate, including both those who finished high school only and those who went on to complete postsecondary credentials. Canada has the highest proportion of college graduates compared with other OECD countries. In 2016, 22.4% of the Canadian population aged 25 to 64 had a college diploma as the highest educational qualification, up from 20.4% in 2006. In comparison, an estimated 8% of the population among OECD countries overall had a college diploma in 2016. Responding to a call for more skilled trades workers in certain industries and regions, government programs have been introduced to increase participation in apprenticeship training in recent years. Young men have responded to job opportunities and incentives by moving into this sector. The percentage of young men aged 25 to 34 with an apprenticeship certificate in the skilled trades as their highest level of education increased from 4.9% in 2006 to 7.8% in 2016. Men with an apprenticeship certificate in the trades had strong earnings. Their median annual earnings in 2015 were 7% more than men with a college diploma, 31% more than men with a high school diploma, and 11% less than men with a bachelor's degree. On the other hand, the percentage of young women with an apprenticeship certificate has remained relatively stable since 2006 at under 2% and their lower earnings showed they were apprenticing in lower-paying trades. For example, almost 3 in 10 women with an apprenticeship certificate apprenticed in hairstyling, with median earnings of $34,319. Whereas the greatest gains in postsecondary education for men were in apprenticeship training, women are increasingly equipping themselves through university credentials to meet the skills needs of the country. More than 4 in 10 (40.7%) young women aged 25 to 34 had a bachelor's degree or higher in 2016, up from just under one-third in 2006. This continues a trend begun in the early 1990s when the proportion of young women with a bachelor's degree or higher surpassed that of young men. Women's investment in education has paid off such that women with a bachelor's degree earned around 40% more than women with a college diploma and around 60% more than women with a high school diploma as their highest level of education. The strong results for women with a bachelor's degree were found to be consistently the case across the country. In 2016, for the first time, women accounted for slightly over half (50.6%) of young Canadians (aged 25 to 34) with an earned doctorate. They accounted for the majority of young graduates with an earned doctorate in many fields, including education, social and behavioural sciences and law, health and related fields, visual and performing arts and communication technologies, and humanities. However, women still made up less than half of young graduates with an earned doctorate in fields such as architecture, engineering, and related technologies, mathematics, computer and information sciences, and physical and life sciences and technologies. Even though more young men are obtaining degrees at the bachelor's level or above over time, their increase has been at a slower pace than for young women. Close to 3 in 10 (29.1%) young men aged 25 to 34 had a bachelor's degree or higher in 2016, up from one-quarter in 2006. The census data make it possible to examine the earnings of Canadians with various educational qualifications and to look at how young graduates are doing in the labour market, including the relationship between their field of education and their job. These topics are covered in the articles from the Census in Brief series on education, including "Does education pay? A comparison of earnings by level of education in Canada and its provinces and territories," "Are young bachelor's degree holders finding jobs that match their studies?," and "Is field of study a factor in the earnings of young bachelor's degree holders?". Among Canadians aged 25 to 64 with postsecondary qualifications, 81.4% were graduates in fields important for building a strong social infrastructure, such as education, communications, justice, health and others. Contributing to the advancement of Canada's science and technology competitiveness, 18.6% of working-age Canadians with postsecondary qualifications graduated from science, technology, engineering and mathematics (STEM) fields. Among all young bachelor's degree holders aged 25 to 34 from STEM fields, those from engineering and computer and information sciences were the most likely to bring their skills to the sector of the labour market closely related to their training, with 7 in 10 working in science and technology occupations. Men were more likely to study engineering or computer and information sciences than women: over 5 in 20 young men with a bachelor's degree graduated from these fields of study, compared with under 1 in 20 young women with a bachelor's degree. With an aging population, health care skills are increasingly important for the labour market. In 2016, most graduates in health fields at all levels of education were women and they were finding work that matched their studies. For example, women accounted for 92.7% of young nursing graduates aged 25 to 34 at the bachelor's level and 64.4% of young graduates with medical degrees. About 95% of young nursing graduates worked in health occupations. Further, the earnings of young nursing graduates were as high as young engineering graduates. The median earnings of young women with a nursing degree were $75,027 in 2015, while those for young women with a degree in engineering were $75,023. The difference in earnings between these two fields among men was also very small. This reflects the strong demand for the skills of nursing graduates in an aging society. Women also accounted for the majority of young graduates aged 25 to 34 in health fields at the college level. For example, about 65% of young college graduates in fields related to health diagnostic and treatment technologies (such as mammography and MRI technicians) were women. Furthermore, 85.1% of young employed women with a college diploma in these fields worked in health occupations. Immigrants contribute to Canada's economy by bringing their skills and high levels of educational attainment. Canada's immigration system highly values education. In recent years, new programs have made it easier for international students who have completed their postsecondary education in Canada to immigrate into the country. As of the 2016 Census, 4 in 10 immigrants aged 25 to 64 had a bachelor's degree or higher. In comparison, just under one-quarter of the Canadian-born population aged 25 to 64 had a bachelor's degree or higher. Recent immigrants who landed in the five years prior to the 2016 Census were especially well-educated, with over half having a bachelor's degree or higher. Recent immigrant women were more likely than recent immigrant men to have a bachelor's degree or higher in 2016. The reverse was true in the 2006 Census. 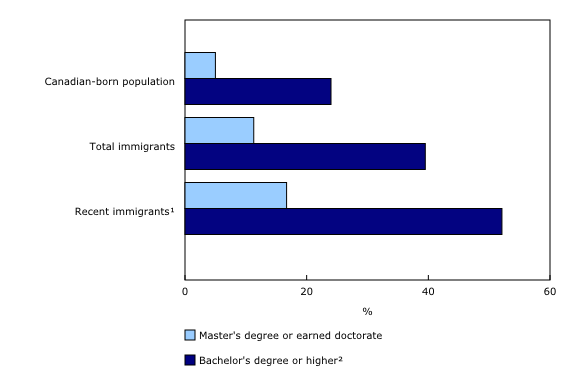 The percentage of all immigrants with a master's or doctorate degree is twice that of the Canadian-born population. Among immigrants aged 25 to 64, 11.3% had a master's or doctorate degree compared with 5.0% among the Canadian-born population. Recent immigrants were even more likely to have a master's or doctorate degree, with 16.7% of them holding these graduate degrees in 2016. First Nations people, Métis and Inuit all saw increases in high school completion. Almost 7 in 10 Aboriginal people overall aged 25 to 64 had completed a high school diploma or equivalency certificate in 2016, up from under 6 in 10 in 2006. Those who completed high school included both people with a high school diploma only and those who went on to obtain postsecondary credentials. Furthermore, First Nations people, Métis and Inuit all made gains in postsecondary education at every level. In 2016, 10.9% of Aboriginal people overall aged 25 to 64 had a bachelor's degree or higher, up from 7.7% in 2006. The percentage of Aboriginal people who obtained a college diploma also increased, rising from 18.7% to 23.0% over this period. The percentage of Aboriginal men with an apprenticeship in the trades grew from 6.8% to 9.6%. First Nations people with Registered Indian status living on reserve face greater barriers in accessing educational opportunities. For example, many have to leave their communities to attend educational institutions, including high school. The 2016 Census data show that those who lived off reserve were more likely to have completed a postsecondary qualification than those living on reserve. For example, 11.4% of First Nations people with Registered Indian status aged 25 to 64 living off reserve had completed a bachelor's degree or higher in 2016, compared with 5.4% of those living on reserve. The difference was smaller at the apprenticeship level, with 4.9% of First Nations people with Registered Indian status living off reserve having an apprenticeship certificate, compared with 3.9% of those living on reserve. Mothers in lone-parent families, many of whom may face financial and other barriers to participation in the education system and the labour market, are increasingly equipped with skills at the bachelor's level or above. In 2016, 20.4% of lone mothers aged 25 to 64 had a bachelor's degree or higher, up from 14.7% in 2006. Nevertheless, their educational attainment was still lower than that of other women. For example, 39.0% of mothers aged 25 to 64 who are married or living common law had a bachelor's degree or higher in 2016, up from 26.9% in 2006. For the first time, the census included information on the admission category under which immigrants to Canada have arrived. The Canadian immigration system has three broad goals: to attract educated and skilled immigrants, to reunify families, and to provide humanitarian and compassionate refuge. Immigrants admitted under the refugee category face particular challenges as they are not admitted based on education, language or other assets, and may not have all of the skills required to find employment in their new country. Close to one-third of refugees (31.5%) who have received their permanent resident status, upgraded their educational credentials by completing their highest postsecondary qualification in Canada. When looking only at those who arrived as adults (aged 18 and older), about 22% upgraded their education with higher qualifications in Canada, slightly more than immigrants admitted under either the economic or family categories, both at about 20%. The majority (71.1%) of refugees who immigrated to Canada as adults and upgraded their educational qualifications in Canada completed a trades or college diploma. In comparison, among economic immigrants who upgraded their education in Canada, the majority (56.5%) completed a bachelor's degree or higher. University graduates tend to live in large urban centres—or census metropolitan areas (CMAs)—where universities are often located and jobs for these graduates may be more plentiful. Ontario, British Columbia, Alberta and Quebec are the four provinces with the largest urban centres in Canada, and they, along with Nova Scotia, had the highest proportions of the adult population aged 25 to 64 with a bachelor's degree or higher among the provinces in 2016. Quebec had the highest percentage (63.2%) of young STEM graduates aged 25 to 34 who worked in science and technology occupations, followed by Newfoundland and Labrador (57.7%) and Alberta (55.7%). Compared with all other provinces, these three provinces had a higher proportion of STEM graduates from 'engineering.' As discussed previously, engineering graduates were very likely to work in science and technology occupations. Other factors, such as the high demand for STEM graduates in the resources sector in Alberta and Newfoundland and Labrador and in the aerospace and high tech sectors in Quebec, likely also contributed to STEM graduates in these regions finding work related to their fields of study. Compared with other provinces, resource-rich provinces such as Alberta and Saskatchewan had the highest proportions of men aged 25 to 64 with an apprenticeship certificate in the skilled trades. Due to the high demand in these provinces, these men were paid well. In Saskatchewan, men with an apprenticeship certificate were paid more than men with a bachelor's degree. In Alberta, men with an apprenticeship certificate earned only 5% less than men with a bachelor's degree and more than men with a bachelor's degree in every other province. Yukon was second only to Ontario in the proportion of the adult population aged 25 to 64 with a bachelor's degree or higher, and the proportion of men with an apprenticeship certificate in the skilled trades in Yukon was as high as that of Alberta. A large proportion of these graduates completed their education elsewhere, indicating that many were drawn to Yukon for job opportunities. For example, 78.3% of the adult population with postsecondary qualifications in Yukon completed their education elsewhere, the highest percentage in any province or territory. At 28.5%, Newfoundland and Labrador had the highest proportion of the population aged 25 to 64 with a college diploma as their highest educational qualification in 2016. This was followed by the other three Atlantic provinces: Prince Edward Island (28.2%), New Brunswick (26.1%) and Nova Scotia (25.9%). At 24.7%, Ontario ranked fifth. Two of the top 10 urban centres with the highest percentages of college graduates were from the Atlantic provinces: St. John's (29.4%) and Moncton (29.2%). The remaining eight were all in Ontario: Greater Sudbury (34.2%), Belleville (32.7%), Oshawa (31.6%), Peterborough (31.6%), Barrie (31.0%), Brantford (30.3%), Kingston (29.6%) and Thunder Bay (29.3%). Overall in Canada, smaller urban communities—or census agglomerations (CAs)—had a higher proportion of the population with a college diploma than large urban centres. The highest proportion was in the smaller urban community of Carleton Place (35.5%). With many jobs in the public sector and high technology, Ottawa—the Ontario part of the Ottawa-Gatineau CMA—was the large urban centre with the highest proportion of the adult population aged 25 to 64 with a bachelor's degree or higher (43.5%) in 2016. This was followed by the CMAs of Toronto (40.9%), Calgary (38.3%), Vancouver (37.5%) and Halifax (35.2%). The CMAs of Calgary and Kitchener–Cambridge–Waterloo had the highest proportions of STEM graduates at the bachelor's level or above, as they offer many jobs in the resource and IT sectors. The educational portrait of Canadians has changed considerably in the 150 years since Confederation. At the time of the first census after Confederation, in 1871, very few Canadians attended school due to the demands of a predominantly farming- and food production-based economy. By 1901, more children were enrolled in elementary or secondary schools, although many did not attend on a daily basis. Legislation was subsequently introduced in most provinces on the minimum amount of time children must attend school full time. After 1963, all provinces enforced legislation that children must remain in school up to the age of 15 or 16. By 1996, the minimum school-leaving age was 16 in all provinces and almost all children up to that age were enrolled in school full time. In terms of postsecondary education, since Second World War, full-time university enrolment has risen dramatically among youth aged 18 to 24, from under 3% in 1941 to 23% in 2014/2015. As Canadian society has changed, fields of study offered at postsecondary educational institutions have adapted to the evolving educational requirements of the labour force. For example, starting with the "PC boom" and the "dot-com boom" in the 1980s and the 1990s, as well as the emergence of the information society, programs in computer sciences were expanded and new fields such as information technology, network administration and webpage and multimedia design were offered. Over the years, women have caught up to and surpassed men in university participation. By 1989, there were more women than men enrolled full time at Canadian universities, as they made gains in programs such as law and medicine, fields traditionally pursued by men. Since the 1990s, the proportion of women with a bachelor's degree or higher has grown much faster than among men. Canada has also developed a very extensive and unique college system since the 1960s to provide training opportunities focused on work-integrated learning and matching skills with the demands of the current labour market. In 2016, 22.4% of the adult population aged 25 to 64 had a college diploma, compared with an estimated 8% among the Organisation for Economic Co-operation and Development (OECD) countries overall. Because of its large college sector, not seen in most other OECD countries, Canada has been a world leader in postsecondary education, ranking first in the OECD for the proportion of the population who are college or university graduates since the 1990s. In this document, all qualifications reported are the highest certificate, diploma or degree, unless otherwise specified. 'College diploma' refers to college, CEGEP and other non-university certificates or diplomas. 'University degree' refers to bachelor's degrees or higher levels of education. These degrees can be granted by universities or by other degree-granting institutions such as colleges. The term 'recent immigrants' refers to immigrants who first obtained their landed immigrant or permanent resident status between January 1, 2011 and May 10, 2016. The term 'Canadian-born' refers to non-immigrants or Canadian citizens by birth. The Canadian-born population includes Canadian citizens by birth born inside and outside Canada. The Canadian-born population excludes immigrants born in Canada. Non-permanent residents are excluded from the analysis when looking at the percentage of women among those with an earned doctorate. In this analysis, the terms 'lone mothers' and 'mothers who are married or living common law' refer to mothers living in a census family that have at least one child between the ages of 0 and 17. The term 'science and technology occupations' refers to the major grouping of 'natural and applied sciences and related occupations' in the National Occupational Classification (NOC). Today, Statistics Canada is releasing a sixth series of data from the 2016 Census. These results are on the highest level of educational attainment, major field of study and location of study as well as school attendance of the Canadian population at the national, provincial, territorial and subprovincial levels in 2016. Results on labour, journey to work and language of work are also being released today. Analytical products include three articles from the Census in Brief series. The articles provide analyses focusing on the labour market outcomes and earnings of Canadians by highest level of education and field of study. The first article highlights the earnings by highest level of education of the population aged 25 to 64, while the second and third articles focus on the labour market outcomes and earnings of young bachelor's degree holders aged 25 to 34 in Canada. Data products include education data for a wide range of standard geographic areas, available through the Census Profile, Data tables and Highlight tables. Reference materials contain information to help understand census data. They include the Guide to the Census of Population, 2016, which summarizes key aspects of the census, as well as response rates and other data-quality information. They also include the Census Dictionary, which defines census concepts and variables and the Education Reference Guide, which explains census concepts and changes made to the 2016 Census. This reference guide also includes information about data quality and historical comparability, and comparisons with other data sources. Both the Dictionary and the Guide to the Census of Population are updated with additional information throughout the release cycle. An infographic entitled Canada's educational portrait illustrates key education findings from 2016.